Researching your family tree is an interesting, and occasionally eye-opening endeavour. There are the black sheep, surprising origins and occasionally even the odd newsmaker you discover around your ancestry. I've been digging up the roots of my tree on a very casual basis for some time. The biggest brick wall to my enthusiastic pursuit of this hobby is the loss of records in Europe during the war, which probably means that once retired I must take a trip to see what I can discover in the land of my heritage. That land is Germany. Or, more specifically with regards to my father's family, Bavaria — the place of dirndls and lederhosen, folk music, pretzels, beer and, of course, Oktoberfest. This annual fair is held in Munich, for 16 days beginning near the end of September. The tradition began in 1810 when Crown Prince Ludwig was married and the citizens were invited to to attend the royal festivities in a field. Today Munich's Oktoberfest is known as the Largest Volksfest (Peoples Fair) in the World. Here in Canada, the Greatest Bavarian Festival and second-largest Oktoberfest internationally is held in Kitchener-Waterloo, Ontario, an area where many residents still claim German heritage. This party starts on the Friday before Thanksgiving and ends on the Saturday after. 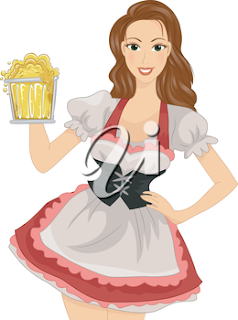 Therefore, in celebration of this 'gemütlich' time of year, here are some terrific Oktoberfest illustrations sure to have you raising a glass and shouting "Ein Prosit". The Only Cute Mouse Is... ?